The Montana Standard is a Lee Enterprises daily newspaper and website in Butte, Montana. The women's page or women's section of a US newspaper was a section devoted to covering news assumed to be of interest to women. Women's pages started out in the 19th century as society pages and eventually morphed into features sections in the 1970s. Although denigrated during much of that period, they had a significant impact on journalism and in their communities. Scouting in Montana has a long history, from the 1910s to the present day, serving thousands of youth in programs that suit the environment in which they live. J. C. Penney Company, Inc. is an American department store chain with 864 locations in 49 U.S. states and Puerto Rico. In addition to selling conventional merchandise, J. C. Penney stores often house several leased departments such as Sephora, Seattle's Best Coffee, salons, auto centers, optical centers, portrait studios, and jewelry repair. Robert "Bob" O'Billovich, nicknamed "Bobby O" or "Obie", is an east regional scout for the BC Lions of the Canadian Football League (CFL). O'Billovich has been involved with the CFL since 1963 in the roles of player, coach, general manager, scout, and several front-office positions. As a long-time coach in the CFL, he won 107 regular season games in the CFL, the eighth highest win total by a head coach in the league's history. James Cash "J. C." Penney Jr. was an American businessman and entrepreneur who founded the J. C. Penney stores in 1902. The Quad-City Times is a daily morning newspaper based in Davenport, Iowa, and circulated throughout the Quad Cities metropolitan area. This is a broad outline history of the state of Montana in the United States. Our Lady of the Rockies is a 90-foot statue, built in the likeness of the Blessed Virgin Mary, that sits atop the Continental Divide overlooking Butte, Montana. She is also intended to be entirely nondenominational, and was dedicated by workers to woman everywhere, especially to mothers. It is the fourth-tallest statue in the United States after Birth of the New World, The Statue of Liberty, and the Pegasus and Dragon. Lee Mantle was a United States Senator from Montana. Butte High School is a public high school in Butte, Montana. It was established 122 years ago in 1896. Arnold Olsen was a U.S. Democratic politician who served as the Attorney General of Montana from 1949 to 1957, and as a member of the United States House of Representatives from Montana's 1st congressional district from 1961 to 1971. KGLM-FM is a commercial radio station in Anaconda, Montana, broadcasting to the Butte, Montana, area playing CHR-Pop music. The station, established in 1974, is currently owned by Butte Broadcasting, Inc. The main offices and studios of Butte Broadcasting are at 660 Dewey in Butte. The transmitter site is north of Sheep Gulch Road in Anaconda, Montana. Carol Sutton was an American journalist. She got her journalism degree from the University of Missouri. In 1974 she became the first female managing editor of a major U.S. daily newspaper, The Courier-Journal in Louisville, Kentucky. She was cited as the example of female achievement in journalism when Time named American Women as the 1975 People of the Year. During her tenure at the paper, it was awarded the 1971 Penney-Missouri Award for General Excellence and in 1976 the Pulitzer Prize for Feature Photography for its coverage of school desegregation in Louisville. She is also credited with significantly raising the number of minority reporters on staff. The Dumas Brothel was a bordello in Butte, Montana. The brothel was founded by French Canadian brothers Joseph and Arthur Nadeau in 1890 and named after the nominal owner, Delia Nadeau, née Dumas, who was Joseph's wife. It grew considerably through the years, with the miners employed by the city's copper mines often patronizing the establishment. After several changes of the "madams" and continuing pressure from authorities, the brothel closed in 1982, described as "a rare, intact commentary on social history". At the time of its closure, it was the longest operating brothel in the United States, having operated years after prostitution was made illegal. After closing, the brothel changed hands several times, eventually becoming a tourist attraction owned and managed by a series of Butte residents. Danielle Wineman is an American actress and beauty pageant titleholder from Cut Bank, Montana, who was named Montana's Junior Miss 2010 and crowned Miss Montana 2015. She competed for the Miss America 2016 title in September 2015. Her younger sister, Alexis Wineman, was crowned Miss Montana 2012. Lisa Diane Gangel Kerney is an American sportscaster, Kerney worked for ESPN until April 2018. 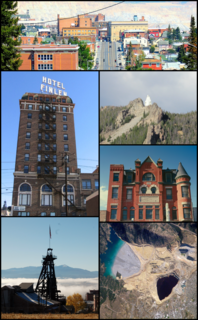 KBMF-LP is a non-commercial low-power community radio station that broadcasts terrestrially from a transmitter atop the historic Carpenters' Union Hall in Uptown Butte, Montana. ↑ "Penney-Missouri Honors to Women's Pages". The Kansas City Times. December 25, 1971. Retrieved 30 December 2018.